Microsoft has completed the move of Roslyn, the next-generation open source compiler for C# and Visual Basic, from CodePlex to GitHub. Program Manager Kasey Uhlenhuth explains that the Roslyn team is not only moving the repository, but also switching to git internally. “We are moving our code to GitHub as well as switching to use git internally. This means we will have fewer moving parts and will get us much closer to the same environment you’d be using on Roslyn code. It will be so worth it,” enthuses Uhlenhuth. CodePlex was launched in 2006 as part of Microsoft’s effort to nurture an open source community around its development platforms. It has been around longer than GitHub, which was launched in 2008, but which has grown to become the most popular repository for open source projects, as well as being widely used for commercial application code. One reason for its success, as the name implies, was its early adoption of Git, a distributed version control system created by Linus Torvalds for Linux development. 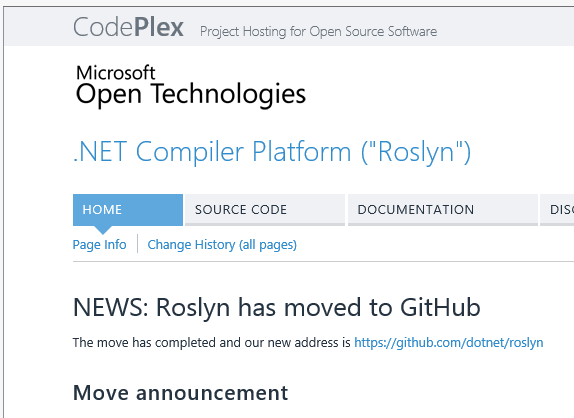 The latest move means that Roslyn joins several other open source .NET projects which are hosted on GitHub as part of the .NET Foundation, including ASP.NET 5 and .NET Core. However, some Foundation projects such as “Katana”, the code name for OWIN (Open Web Interface for .NET) Authentication middleware, currently remain on CodePlex. Why GitHub rather than CodePlex? The key rationale seems to be to go where the community is, especially since Microsoft wants to attract attention from Linux or Mac developers who are unfamiliar with the Microsoft repository. Projects such as ASP.NET 5 have attracted more attention since migrating. “The first impression on the Codeplex site is that every click feels so frustratingly slow. Waiting 4s and more for a site to load doesn’t exactly feel like 2014,” he said. Other complaints are that email notifications do not work, code review is broken, and search is poor. He ends with a plea for Visual F# tools to move to GitHub. "This brings us closer to the longtime home of the F# Open Edition, addresses one of our top bugs, and puts us on the same hosting platform as other great Microsoft open source projects like .NET Core, Typescript, and (soon) Roslyn." There is no suggestion that CodePlex will close down, but with Microsoft moving its premier projects away it would be rational to conclude that does not have much future. Microsoft’s willingness to prefer a better third-party solution over its own technology is a good thing for developers. That said, it does raise some awkward questions. Why, after eight years of development, was CodePlex not performing well? If GitHub is better than CodePlex, what are the implications for Team Foundation Server [TFS], Microsoft’s application lifecycle management tool, or for Visual Studio Online, a hosted version of TFS, since you would imagine that at least some technology is shared between these projects? Both products have full support for Git but so does CodePlex. *NIH - Not Invented Here.